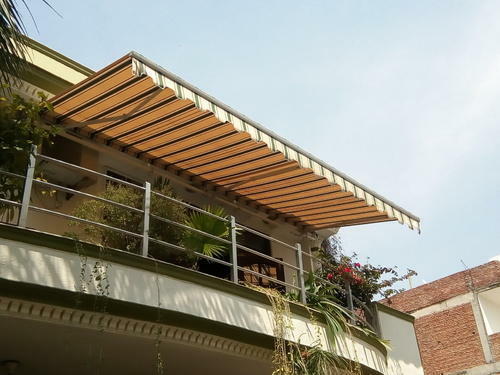 Terrace awnings are the best solution to making your terraces and balconies a comfortable and use-able space . Balconies are a must have in apartments and upper floors of a house but are quite non use-able for most of the year ! Hot summer months are too hot to be out in the balcony , monsoons its raining and the winter gets un-comfortable especially in the evenings . High quality terrace awnings manufactured In-House with state of the art machines and high quality raw materials , the aluminium frames are weather resistant and life long . Outdoor fabrics from Dickson France are made with 100% solution dyed acrylic fabrics which is the strongest outdoor fabric known to man. A large range of vibrant colors and designs would make your terrace or balcony a place to spend time in . These fabric cut heat by upto 75% and are guranteed not to fade for 10 Years. You can motorise your awnings for a one flick operation to have an awning which is technologically advanced as per current world standards .